It’s not that I want your child to struggle; it’s that they need to. When I was a freshman in high school, my arch nemesis slammed me in the back with a music stand when I wasn’t looking. I did what many 14-year-old boys would do in that situation: I turned around and punched the kid in the face. He didn’t get a chance to hit me again because my band teacher was there and marched us both down to the principal’s office. Even though I made it clear to the principal that the kid hit me first, that I was innocent, and that I’d never been in trouble before, I was suspended from school for the rest of the week. I went home and told my mom what happened. I expected her to storm into that principal’s office and demand my punishment be lifted. I wanted her to defend me and make them let me come to school the next day. I wanted her to go into mama bear mode and make that principal cower before her. Instead she grounded me and said that’s not how she nor my principal thinks I should have reacted when the kid hit me in the back. She said that maybe my punishment would teach me that lesson. It turns out it did. I’d never been in trouble like that before and had some time to think about what happened. Maybe I did call the kid a mean name right before he hit me with the music stand. Perhaps I was hoping he’d do that so I could hit him back. Maybe retaliating wasn’t worth it. I can’t help but wonder if I would have learned this lesson if my mom would have chewed out the principal. It would have saved me some embarrassment from getting suspended and kept me from having to make up as much work, but it probably would not have been good for me in the end. As a school leader, you often see kids who need that learning moment. Whether it’s detention or cleaning up a classroom they made a mess of, sometimes students have to struggle if they are going to grow. However, the way my mom handled my situation is not always the norm, especially in 2018. The parent who, out of good conscience, mows down any obstacles that might cause their child to struggle. As an educator, how many times have you felt that a student needs to face a consequence and learn a specific lesson but have had a parent think otherwise? 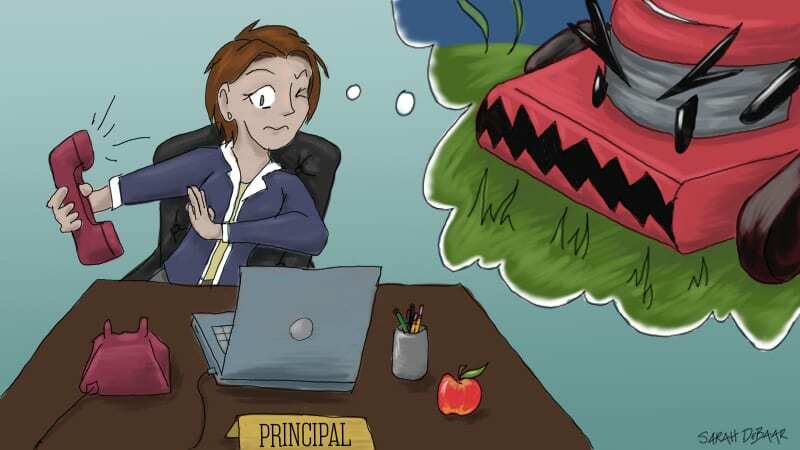 Whether it’s the parent who marches down to the student’s classroom to make sure they aren’t marked absent, the parent who emails the coach weekly because their kid isn’t getting enough playing time, or the parent who contests every one of your decisions on discipline, lawnmower parents can be challenging to work with. When you’re leading a school, however, one of your greatest assets is parents. They are the organizers of potlucks, the raisers of funds, the school board petitioners, the supporters of teachers, and so much more. All of us want what’s best for kids. So how do we work with parents who don’t want their kids to face consequences? Part of helping lawnmower parents understand the need for students to struggle is letting go of the battle mentality. I’ve talked to defensive parents before who start the phone call at a level 10. I used to meet their abrasiveness with my own anger. I mean, their kid was the one fighting, cheating, lying, or smoking. And every single time, I found that fighting fire with fire did not work. Never before have I successfully yelled loud enough to get a parent to understand my point of view. So before any parent phone call or meeting, I make sure I am calm. Here’s a tip: Did you know there is a setting in Gmail and Outlook that allows you to retract an email? You can set it to where you can take back an email up to a certain amount of time. It might be worth turning on that setting, just in case you are a little hasty when replying to an angry email, one you instantly regret once you send it. It’s good practice to schedule in-person meetings at least a day after the incident that will be addressed. Give yourself time to cool down. Share the purpose behind your course of action. Sometimes you just need to remind parents that you have their child’s best interests at heart. This can start with storytelling. Share with parents an instance that’s similar to the one their child is in. You don’t need to go into specifics but tell them how a student came out on the other side. Be honest and talk about how it’s hard to hold students accountable sometimes but how you have seen, time and time again, the benefit of it. When a parent is feeling defensive or is hearing many sides to the same story, they might struggle to identify your intent. So make it clear that your discipline is really about student success. One time a lawnmower parent called me and started screaming as soon as I answered the phone. It was accusation after accusation, and I just sat and listened. When I finally spoke, I wanted to say everything that was on my mind. I wanted to debate her because I had the full story and she didn’t. Instead, I apologized if I hadn’t communicated well with her. I then told her something I really liked about her son. I said that that was the kid I want to see more of in school. Instantly, the tension eased, allowing us to talk calmly about the incident. I’ve found that once parents know that I really do care about their child, they will defend me. This parent never called me in anger or with accusations again. Actually, her son showed up before school the next day and apologized to me. I began hearing through the grapevine how highly this mother spoke of me to other parents. This is what happens when we become partners with parents. But sometimes you have to hold your ground. “You have to understand that the parent wants what they feel is best for their child. We also want what is best for their child, but we have an entire student body and faculty that also must be taken into consideration when making decisions,” says high school principal Dr. Jason Clemensen. If a parent doesn’t understand your decision and you know you made the right one, you have to stand firm. This isn’t about stubbornness or pride, although you should always check if it is. This comes down to a standard you have set for your school and a commitment to ensuring that students truly grow. Sometimes growth only happens when students struggle, and there might be parents unwilling to accept that. Those are times when the school leader has to realize they might not ever get to be friends with everyone, and that is okay. Working with lawnmower parents is difficult. It’s can be hard communicating your best intentions. Not fighting back is tough. It’s difficult to not feel trusted. However, like students who struggle, facing these challenges as an educator and leader will only make you stronger. Plus, check out this article about what every principal should know.